It would be wonderful if I had a Champions League diary entry to do now, but sadly it wasn't to be. My biggest regret is that a) we went out to a patently inferior team in PSV (especially when their one class act, Alex, injured himself immediately after beating us, leaving the Scousers with an even easier task in the next round) and b) I felt that the Champions League trophy was there for the taking this season. Milan might have risen to the occasion in the last couple of rounds and I quite fancy them to beat Liverpool tonight, as I got the distinct sense from Clarence Seedorf's impressive performance in the last round, that there are players in this Milan squad like the Dutchman and Maldini who are well aware of their impending top flight mortality and who appear desperate to see their careers out on a high. Moreover, a substantial number of this Liverpool squad have already made an appearance in a Champions League final, in Istanbul, where they were highly charged on the sort of vast amounts of adrenaline that must course through the blood of a young professional playing on the biggest stage in the game and which resulted in their amazing second half comeback in that game. Yet I wouldn't be the least bit surprised if some of them are a little more blasé about their match in Athens and to my mind, perhaps subconsciously, the effect is likely to be that they might be unable to reproduce the same sort of intensity. By contrast the majority of this Rossoneri squad will still have a memory of the bitter taste of their defeat in Istanbul and the utter dread of having to repeat the awful experience of that long journey home from such a glamorous final, without the trophy, only to have to face the music in the media on their return, plus the fact that Milan are blessed with slightly better quality players in certain areas of the pitch, is to my mind going to make the difference, in what I expect to be a far less exciting event than their previous encounter as the fear of losing for both teams is likely to make for a far more cagey affair. Equally frustrating as far as I am concerned is that I felt there weren't any really outstanding contenders for the trophy in the earlier stages of this competition and I was therefore disappointed because it seemed to me that with a little assistance from Lady Luck, any team that reached the knockout stages was capable of coming home with the one trophy that continues to elude us. Although, based on the two teams recent form, I think we might have struggled to beat Milan. But then one of the biggest attractions about the beautiful game is that, in spite the fact that sadly the financial aspect to the sport has made matters somewhat more predictable, it continues to be the case that in a one off match, any team is capable of beating another. This is probably the principle reason why I loathe being forced to make predictions, as the longer one watches football, the more one is aware how easy it is to be made to look a complete idiot. Additionally the downside to writing this diary is that any presumptions about the outcome of matches are out there in the public domain, where one is wide open to having the piss taken. My other reason for feeling smug is due to the media's focus on Milan's Kaka, since the pretty boy Brazilian blew Man Utd away in the semis. But I've been singing the praises of just about my favourite non-Arsenal player, ever since I first saw him play for the Rossoneri some years back, when Kaka first came from Brazil and it's hard to resist a bit of "told you so" type trumpeting, when I know it's down there in black & white in diary pieces from many moons back. Tonight's game is unlikely to be the sort of miraculous goalfest seen two seasons back but as far as I am concerned, I am keen to watch any match involving Kaka, much as was the case with Dennis Bergkamp. While you know that there's always the chance they'll have an off night, with a somewhat anonymous performance where they might struggle to have some impact, there is also always the possibility of them producing those absolutely magical moments, of the sort that any lover of true footballing artistry just cannot afford to miss. Meanwhile, in accordance with the trades description act, I'd better get back to more Arsenal related matters. The real raison d'etre for this post is that with the looming prospect of a couple of months of Arsenal cold turkey, I thought the details of my outing last night might be appreciated. I was most fortunate to be invited along to an auction at Bonhams in aid of Bob Wilson's Willow Foundation. With the ever impending due date of 1st June for our season ticket renewals, I'm hardly in a position to donate three hundred quid for a ticket, despite it being for such a worthy cause. Thus I was only able to go along as the guest of a fellow Arsenal mailing list pal. Steve Birnie got in touch with me about a month back to send me a link to the Willow Foundation web site, with details of the evening, and to ask if I wanted to join him on the night. 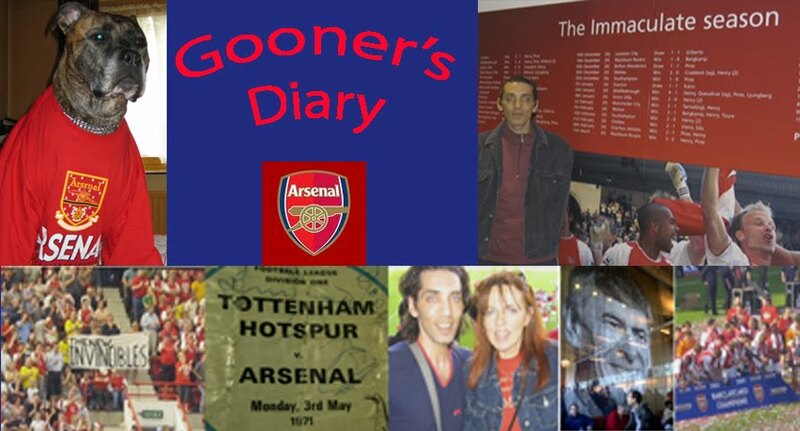 Steve’s a very interesting case, as you don't get many examples of a more devoted Gooner. Having emmigrated Down Under many years back and settled down, married a Sheila and made a couple of babies, I first met Steve at St. Marys some three years ago, when he came over to England to visit his folks and to take in a couple of Arsenal games (although I wouldn’t dare be so presumptuous as to mention these two motives in order of priority!!). Being around the same age as myself and as an avid Gooner from early childhood, we got on like a house on fire, what with us sharing so many Arsenal memories. Having gone back Australia, I was astonished to hear some time later how his trip to England had reawakened his adoration of all things Arsenal and how he'd subsequently decided to uproot his wife and two kids, to return to the motherland, basically because he couldn't bear to remain recreationally challenged, separated from his beloved Gunners by so many thousands of miles. His timing was perfect, as his return to England coincided with the last season at Highbury and the building of the new stadium. After scratching around for tickets to most every game during his first year back, Steve was able to invest in a Club Level season ticket at the new gaff. We've all been fortunate to have enjoyed the sort of warm Spring weather which made Julio Baptista's moaning sound like the barmiest of excuses. But having endured a couple of years of the sort of miserable weather conditions that we are used to in this country, Steve's missus has struggled to settle down in the UK and although his two kids are both young enough to adapt to their new environment without any bother, apparently she's not particularly happy. Steve revealed to me last night that for her sake, they are going to have to return to Australia at some point in the near future. They might be able to watch all the games in Aus, but he explained that having enjoyed his return to his passion so much these past couple of seasons, it's hard for those of us who take it for granted, to appreciate the difference down under, without the breadth of daily coverage in the media and with none of the range of the sort of TV programmes like Soccer AM that have become part of the landscape of football in the UK. Consequently, as far as he's concerned, he can't get enough of Arsenal during the time he has left over here and is therefore keen to take every possible opportunity to attend absolutely every and any Arsenal related event. I felt so honoured to be invited as Steve's guest that I wouldn't have dreamed of turning his kind invitation down. However when it came to it, after schlepping scenery all day for the ballet yesterday, I arrived home feeling so smelly and exhausted, that all I wanted to do was have a shower and put my feet up in front of the telly. Not being a drinker, a champagne reception held little attraction for me and it took some effort to get myself spritzed up and drag my aching bones into the car, to drive through rush hour traffic in the West End in order to attend this sprauncy event at Bonham's auction rooms in Bond Street. Obviously I was looking forward to the idea of being able to lig with a few current and ex-Arsenal player, but I didn't expect too many to turn up, as I assumed that most would have already either returned to their homelands, or be soaking up some rays on a sun-kissed beach. As it turned out, I was glad I made the effort. Included in the cost of Steve's "golden ticket' was the prospect of having his name put into a draw which was to be announced at the end of the evening, whereby each ticket holder would end up taking home one of the vast array of the signed and framed photographs of Arsenal players past and present which were on display on the walls of the auction room. Naturally as usual I was just a little bit tardy and by the time I got there, Steve had already had an oppoortunity to look around at all the photographs and the items included in the auction. Apparently Perry Groves had joked with him that if he ended up receiving one of the two photographs of Ashley Cole, he was going to take it outside and burn it! I might not be a drinker of alchol of any description and this is doubly true of champagne (after a childhood incident on a boat in Spain, where my lovingly cruel old man left me to learn my own lesson, as I gleefully downed several plastic cups full of fake champers and following a 24 hour period of incessant technicolour yawning, ever since I’ve been unable to smell the stuff without wanting to instantly upchuck). So I wasn’t the least bit bothered about missing out on being able to make the most of the free booze but I was very glad that I got there in good time for a wander around, rapidly getting drunk in my own way, as I wallowed in all the nostalgia on view and all my memories of Arsenal players past and present portrayed around the walls, as well as several marvelous images of bygone Gunners who played for the club long before my time. To my mind there is something far more evocative about the old black and white photographs than the glaring reality of the modern day colour ones. I myself was an avid collector of Soccer Stars and in fact I still have several complete albums (albeit somewhat nicotine stained and crispy these days, as they collect dust in the cupboard) from the late sixties and early seventies. But I've an absolutely dreadful memory for names and faces (and everything else for that matter). By contrast Steve's recall abilities are astonishing, as not only was he able to identify all the Arsenal players hiding behind some monstrously huge sideburns (eg. Jeff Blockley), but he was also able to name the opposition team and almost every obscure individual performing in each of the photos. Prior to the auction, whilst the high-rollers present (including the likes of Lord Harris, Frank Warren etc.) sipped their champagne and nibbled on their fancy canapes, we heard brief speeches from the main man at the Willow Foundation and Meg Wilson, to explain the charity's purpose, before Bob Primose Wilson himself got up to speak, obliged to explain the origin of his flowery middle name, after his wife had alluded to it. Apparently he was given the mad moniker Primrose, in honour of his methodist chaplain grandfather and as Bob explained, it would’ve been no bother if he'd had an artistic bent and become a painter, but in the macho world of football, it made one an easy target for abuse, for example when he flapped at a near post corner at Wembley. I've always loved Bob Wilson. Not just because I admired the bravery of goalkeepers of yesteryear, who dived in without a moment’s hesitation, where the boots were flying, (wearing his skimpy green jersey and white shorts), with nothing like the sort of namby-pamby protection afforded by the refs to modern day goal minders, to the extent that the current incumbate is prone to throwing his toys out of his pram should an opponent dare to tread on his toe. Sadly the game we love is fast becoming almost a non-contact sport and you only had to watch the black & white TV pictures shown in the build up to Saturday’s FA Cup Final, to appreciate that the likes of a somewhat cowardly (by comparison) Lehmann wouldn’t have lasted five minutes in the butch hurly-burly of the old-fashioned aggressive game of yesteryear, where such was the lack of protection from the man with the whistle, that taking out the keeper was seen as a legitimate tactic – although if I’m not careful, I’ll start to sound like a Monty Python character ranting on about the macho old days, when men were men and women wore Lilywhite! To me Bob Wilson is not only the heroic player who minded goal during that magical season of 70/71, but he’s also demonstrated quite what a true Gooner he is, in his devotion to the Gunners ever since. There’s no mistaking the extent of Wilson’s allegiance to the cause, whenever he’s asked to comment on TV and in his work for the media he has always come across as a real “mensch” and one of the game's true gentlemen, in every sense of the word. This was ably demonstrated last night during Bob's speech, as he spoke about all the photos around us on the walls. When he told how the two photos of Alan Ball must have been some of the last things Ballie signed before he passed away, Bob literally choked on these words, while a tear or two ran down his cheek. We also heard a marvelous anecdote from the Double season. You'll have to forgive me if my sieve like memory prevents me from retelling it in Wilson's exact words, but I will nonetheless do my best. Apparently as they were about to leave the Highbury dressing room to meet Man Utd, Don Howe held them back for a moment. Howe's timing was awful as apparently Frank Mclintock's head dropped, as Howe detailed out loud how Dennis Law had escaped our captain, to score a couple of goals in the Gunners’ last game against those northern monkeys and so our esteemed coach instructed McClintock that the first time Law received the ball, Frank should clatter him from behind and kick him right up in the air. "With you both being fiery Scotsmen, Law's bound to get up and bop you one on the nose and get himself sent off". To which McClintock responded "but I'll get myself sent off as well", whereupon Howe replied "yeh but they will miss him a lot more than we'll miss you!" The respect Bob has earned throughout the footballing world was demonstrated by the turn out of such Arsenal luminaries as Tony Adams, Martin Keown, Theo Walcott (with his old man in tow as his minder) and Charlie George - although gawd love him, Charlie is my absolute hero, but one gets the impression that he'd turn up to the opening of a paper bag and with free champagne and posh snacks, there was probably no keeping him away! Whereas Patrick Vieira sent his missus along, with an apology from Paddy as apparently he'd been sent back to Paris for an operation. Then again, before I arrived Steve had a conversation with Charlie George and enquired as to why Charlie hadn't been involved at Wembley on Saturday in the parade of FA Cup legends, as the representative from the 71 final. After all Charlie WAS the 71 final, since there are few more memorable Wembley images than the famous one of him lying on his back on the Wembley turf, with his long lank 70s hairstyle. According to what Charlie told Steve, he was invited on Saturday, but it seems he must have had similar thoughts about being involved in this occasion, as those which occurred to me while I watched the weeble likes of John Barnes waddling along the touchline in Saturday’s parade, whilst being roundly booed by both sets of fans. Charlie’told Steve that he didn’t fancy turning up to suffer that level of abuse from both Mancunian and South London scum (mind you I wouldn’t mind betting there were more Moaners present from South London than Manchester!). As the auction itself began, I expressed my surprise to Steve, since apart from the odd famous faces in the room, there was only one other Gooner that I recognised, as he was a regular at away games around the country. But of those other Gooners present, Steve rightly pointed out that the reason I probably didn’t recognise any was doubtless due to the fact that I don’t breathe the rarerified Club Level air. Believe me, it wasn't eau de cologne that I could smell in that auction room, but eau de filthy rich. However I guess such affluent folks don't get to accumulate their substantial pile of spondulicks by spunking it up. Thus despite all those having a hard time, struggling with the weight of moolah in their hefty wallets and despite the fact that it was for such a good cause, for all the encouragement of the extremely accomplished auctioneer, we were both a little taken aback by how much he was having to graft, to try and get any of the high-rollers to bid up. The only other auctions of this type that I’ve attended in the past, have been at charity dinner dance type doos, where dressed in their penguin outfits and after an evening of eating and drinking, I’ve tended to do a runner out of the room, with my need for a fag as a timely excuse for me to miss out on the moment when one is expected to put one’s hand in your pocket. However I assure you that this isn’t because I’m some sort of tight skinflint, but invariably because it’s embarrassing not being able to afford to get involved in the giving and receiving. Steve and I both agreed that if we had the sort of dough that some of these wealthy types have, we’d think nothing of throwing a few grand in a charity’s direction, in return for a fabulous piece of memorabilia (especially when I imagine that the majority are only spending money that would otherwise end up in the government’s hands by way of tax!). In addition to the usual collection of signed shirts, including two particularly fetching yellow ones, one with blue trim signed by the 71 Cup Final team and the other with its iconic CBD badge and Pele’s unmistakeable signature (which I believe fetched five grand), there were a couple of more unusual lots, including a work of modern art produced by Titi himself where the splatters on the canvass were created by him kicking the ball against it. I don’t think Steve intended buying anything, but he was having a great time, sticking his hand up every few moments to make several bids to get the auction going for several lots. I guess if the worst had come to the worst and the hammer had come down on any of his bids, he actually had the wonga to back it up, but I was bricking myself on his behalf, as he bid up to a couple of grand for Thierry’s “painting”. According to the auctioneer this was a one off but the bloke beside us was suggesting that another example produced by Titi had sold for something like £21k at the Arsenal gala evening recently. In which case, if I am correct in recalling that it ONLY went for eight grand, then I guess the bloke who bought it got himself a bit of a bargain! The auction climaxed when these lots had been sold and the screen above us around the room became the focus of everyone’s attention, as everyone held their breath, waiting for the draw in order to discover which particular signed photograph they’d be going home with. Steve was convinced he was going to end up with one of Ashley Cole, while I would assume that Lord Harris must have a massive home, with sufficient space on his walls to accommodate a whole bevy of about a dozen photographs (when you think of how much pleasure some of us would get from having these signed photos of our heroes up on our walls, it would be a crime to think these could end up hidden away somewhere). Included amongst all the photos were plenty of not so legendary Gunners. The idea was that once the draw was complete, you went and grabbed your photo from the wall and we both noted that nobody rushed to collect their picture of Julio Baptista which was rather appropriately somewhat hidden over by the entrance to the karsey! As it turned out, we were both delighted when Steve had a right result, as we discovered that the number alongside his name belonged to a picture of Bob Wilson himself, squatting beside the two silver trophies, taken on the Highbury turf in 71 (with my old West Upper pitch in the background). Once the formalities had finished and while folk were rushing around grabbing their photos off the wall (and boy was I tempted to bag one for myself, as eventually the charity staff began removing pictures that I assume must have been awarded to those who’d bought a ticket but who hadn’t been able to attend – however it would’ve proved just a little bit embarrassing if I’d been collared at the desks on the way out, where they were checking off the tickets and photos!) there was a bit of time before everyone began to drift away. I’d been kicking myself earlier when Steve had asked me to hold his glass and signed Bob Wilson autobiography, as he dived into the throng surrounding Theo Walcott, in order to obtain an signature for Charlie, one of his kids. I wasn’t really interested in getting him to sign something for me, but it was only during the auction when I saw him standing alongside his dad at the back of the room, that it occurred to me that I would’ve liked to get Theo’s autograph, if only for the fact that it would present an opportunity to shoot the breeze with the Arsenal’s young prodigy. Without quaffing copious quantities of alcohol, to aid in the alleviation of ones inhibitions, I invariably suffer from the proverbial “spare pr*ck at the wedding” syndrome, when it comes to such perfect ligging opportunities. In addition to my positively painful shyness, I usually find myself empathising with the players in such circumstances, as it must require creditable reserves of patience, for them to have to constantly cope with pesky punters absolutely each and every time they appear in public, having to put up with an absolutely incessant stream of the exact same banal queries. However I’ve become a little more comfortable in my skin as I’ve aged (and ironically, as the contents of my epidermis gives me more and more pain by the day!) and Steve was having none of it, as he convinced me to collar Theo. Unfortunately I wasn’t sufficiently prepared to be able to pose any of the sort of interesting queries that might enlighten us with details other than those reported in the media and so I am afraid I can only confirm that the papers are correct with their reports that Theo has undergone the required operation on his dodgy shoulder. It occurred to me that it would be a blinder if, after so many requests for autographs, the signing of my guest ticket (which I plan on posting on to one of Ro’s nephews) proved to be the straw which broke the prodigy’s damaged shoulder and set him back several weeks! The other thing I can confirm is that it is true that Walcott is an extremely well-mannered youngster, making time to speak to everyone, with an incredibly polite and patient demeanour. My one concern might be that perhaps Theo is just a little bit too nice and has been brought up in middle class circumstances that have made him a tad too respectable, as he doesn’t appear to have an arrogant bone in his body. Whereas in my experience, it is often the case that there’s a necessary element of arrogance about the vast majority of the very best young sportsmen, because they need to have a substantial ego, in order to have the belief that will set themselves so far above their peers. Hopefully Theo will be the exception that proves this rule, as he’s such a little diamond of a youngster that he deserves to do well and demonstrate that not every young professional has to be a lary sports car owning, loudmouthed yobbbish larrikin. Once I’d cornered Theo, I was on a roll. I was a little disappointed that I couldn’t persuade Steve to let me take any photos with my mobile phone of him and any Arsenal players, as I’ve garnered plenty such trophies in the past and I thought that if Steve is eventually forced to return to Australia, he’d be chuffed to bits to take a couple of photos of him and any Arsenal players back with him. But he declined all my efforts to persuade him to jump in between Martin Keown and Tony Adams and instead wanted to take my phone to take a photo of me. Sadly I stood there too long, waiting to dive in between the two of them and by the time I found a convenient point to interject, without interrupting their conversation, they’d drifted apart, as this would have made for a perfectly composed photo, standing between the two ex-Arsenal centre-backs. The high point for me was when I merely went to ask Adams if he minded posing for a picture with me and he greeted me like a long lost pal. I was chuffed to bit that the ex-Arsenal captain appeared to recognise me from a previous encounters (as it’s been a long time since I last had a chance to meet him). The conversation of the evening came when we collared Martin Keown. Initially we enquired whether he intends on staying within the game, as Steve has seen Martin sitting alongside our current players behind the bench at a few games this season but apparently this is just because he’s entitled to a pass to the paddock at the new gaff. Martin went on to explain that he felt that going from being a player, straight into coaching or management was the easy route as far as he was concerned and he wanted a bit of a break. I got the distinct sense that he feels the need to do something else, if only to validate his own self-worth, by proving to himself that playing or coaching football is not the only thing he is capable of doing, as Keown confirmed that there was every possibility he might come back to the game at a later date, but when he does, he wants to be able to do so out of choice, rather than because it is the only thing he can do. As an old school defender, I instinctively assumed Keown would be a natural advocate of man-marking over zonal defending. Therefore, having spent the past couple of seasons growing increasingly desperate to discover the supposed advantages of zonal defending, I couldn’t resist this opportunity to ask someone in the know. However I have to admit that I lost a great deal of respect for Keown as a potential coach last night, as he went on to astonish me by indicating that he’d become a proponent of zonal defending. Yet he was still unable to make it clear to me why anyone would choose this system, over more traditional defending methods and since he appear somewhat vague on any specific reasons for his choice (perhaps with the inference that a layman like myself might struggle to understand the concept!! ), it was my impression that this choice was merely influenced by the amount of respect he has for other advocates of the system, like Wenger and Benitez. I laugh at such outrageous “chutzpah” when I reflect on our conversation, as I can’t believe that I actually proceeded to spend the next 15 minutes arguing about the principles of defending, with one of the best centre-backs Highury ever saw, trying to convince him that he was talking utter codswallop, as I went on to suggest that zonal defending leaves a side at a disadvantage because when a defender is marking an area instead of an opponent, it means that invariably, when the opponent runs into your specific area, he has far more momentum when he jumps to head the ball, while you are leaping from a standing start. Secondly with a man marking system, everyone knows what they are supposed to be doing, so that if a player has a free header then it’s perfectly obvious who is at fault for letting him go. Whereas with a zonal system, it is fine when the opposition is at the centre of a particular zone, but when he strays towards the perimeter, suddenly there’s a grey area as to the exact point when he becomes the responsibility of ones team mate and therefore I have little doubt that when it comes to apportioning blame for conceding a goal, there are always going to arguments over who should’ve been marking him. If footballers were robots and there was no room for human error, perhaps a zonal system would work, as the specific zones would be delineated in the minds of the defence and everyone would know the exact point at which they were tasked with picking up an opponent. However we are talking about football players, many of whom haven’t reached the pinnacle of their careers as a result of their amazing mental capacity. To the contrary, whether it’s a result of damaging too many brain cells from heading too many high balls, or from too many dangerous clashes of heads, but in general I think it can be said that defenders don’t tend to be amongst the games most intelligent genus, with many having the IQ of a gnat. Consequently, unless they are drilled to the nth degree (which the Arsenal defenders obviously are not!) to the point where the way in which they defend set pieces is almost totally instinctive and unless they are in almost constant communication with one another, in order to acknowledge to their team mate that an opponent has entered their zone and has become their responsibility, sadly in my opinion this system is doomed to fail far more frequently than more traditional defensive methods. And if you are to believe some of the gossip being bandied about recently, the likes of William Gallas would appear to only speak to some of his team mates when he feels they deserve a hard time and if this is the case, he’s hardly likely to maintain a constant stream of defensive chatter, to ensure that the likes of Touré, Eboué and Clichy are constantly doing their own jobs. Mind you I give some credit to Keown, as I am sure it would’ve been far easier for him to have dismissed me as a babbling idiot, rather than to have engaged in arguing his case to any extent (although I’m still pretty much convinced that he failed to elucidate on any specific reasons as to the benefits of a zonal system). However eventually I realised that I was losing his attention as the wandering of his gaze indicated that he was becoming a little desperate for someone else to come and interject, so that he might be rescued from this lunatic, who dared to try and convince him that perhaps I knew better than a man who’d been a professional player since he was in short pants! And I rapidly took the hint offered by Keown’s body language, letting Martin off the hook before he had to resort to being rude. However with him having mentioned the name of Gallas, I couldn’t let him go without enquiring whether he believed there was any truth to the rumours that Frenchman's abrasive attitude makes him a disruptive element in the dressing room. Now I don’t know whether Keown’s response was merely a case of Martin maintaining the footballers’ code of conduct, by avoiding the possibility of bad-mouthing a fellow pro in public, as he wasn’t exactly over effusive in his attempts to suggest that there was no real substance to these rumours, as he went on to explain that Willie was merely a victim of a footballing media that has got it in for Gallas. Then again, I guess it won’t be too long before we eventually find out for ourselves, one way or another, as the evidence of our own eyes should at some point confirm whether or not Willie is in fact some sort of troublemaker, or if Keown wasn’t merely defending one of his own with his allegation that all the smoke is coming from a malicious media. But that’s more than enough rambling from me for now. Hopefully I’ll soon have cause to interrupt an interminably dull cricket season, when our manager makes his move in the transfer market. Otherwise it’s going to be a long couple of months until the pre-season friendlies begin and I’ve some other Arsenal related events to comment on. Although if I’m entirely honest, I won’t exactly be holding my breath, waiting for Wenger to splash the cash, in order to bolster our squad, since I wouldn’t be the least bit surprised if any comings and goings around London N5 are boardroom based and have little direct effect on the playing side. Meanwhile my West Ham supporting pal was chatting to me the other day about a question on one of the WHU web sites, whereby one had to name a player who’d left the club in recent season, but who we’d most love to have back. I struggled at the time when we spoke, to decide on which former Gunner I would go for, but the news over the past 24 hours has answered this question for me. Isn’t there something just a little ironic in the richest club on the planet acquiring Steve Sidwell on a free transfer. Personally I can’t see the sense in Sidwell going to Stamford Bridge, as it’s hard to envisage him getting much of a look in, amongst the wealth of midfield talent in the Blues current squad (although perhaps the Gobby One is expecting some movement in the other direction). From what I understand, Sidwell was a much loved player as a youngster at THOF, with the sort of committed attitude that marked him out as potential captain material. But I am under the impression that ultimately he decided he needed to seek first team football elsewhere, as he wasn’t perceived to be blessed with sufficient quality to earn a regular place in this Arsenal squad. However having seen Sidwell arriving in the box with the sort of late runs from midfield that we’ve lacked ever since Pires left and Freddie lost a crucial yard of pace, I can’t help but wonder whether Sidwell’s going to be the player most likely to come back to haunt us. Moreover, quality isn’t everything and with Wenger’s penchant for only purchasing players who are blessed with sufficient natural ability, it seems to me that our squad and the spirit within the camp could well benefit if Arsene was for once able to choose substance over style? My first visit to your blog.I envy you having the ability to turn down free champagne - my weakness has often led me into unfortunate and expensive misadventures. But there's nothing more gratifying than knowing someone got some pleasure oout of my humble efforts. Gala Gooner Dinner Gone For A Burton!